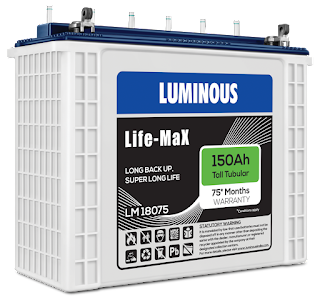 Bengaluru September 19 2017 : Luminous Power Technologies, the market leader in Home UPS with additional offerings in high performance electrical products like fans, modular switches and wires today unveiled its Tubular LifeMax Battery . The battery equipped with high acid volume per ampere hour capacity promises an unparalleled power back up experience with highest ever warranty of 75 months. It is designed with long & tubular plates capable of providing more backup time rugged design built for tough conditions. The batteries are extremely easy to maintain& come pre charged making them instantly useable. For the product Luminous aims to target North, South and East regions with the key states being Karnataka, Bihar, Assam, UP, Uttaranchal, Tamil Nadu, Punjab, Haryana, Chandigarh and Delhi NCR. Luminous Power Technologies is the leading home electrical specialist in India having a vast portfolio comprising of Power back up products such as UPS, Batteries & Solar Solutions to Electrical offerings such as Fans, Wires, Switches & LED lighting. With 7 manufacturing units, more than 28 sales offices in India and presence in over 36 countries, our 6000 employees serve more than 60,000 channel partners and millions of customers. Our motto has always been Customer Delight through Innovation & Passion with focus on Execution & Team-work.